Markings: Blue and red face markings with clan initiation symbol on his flank that glows tan and baby blue. He wears a anklet on his ankle that transforms into a dagger given to him by his parents. Personality: A gentle and curious; soft spoken Eyrie. He values the small things in life. He takes things seriously when they need to be but he is still fun and energetic. He loves learning about faraway places and reading books. He is warm-hearted and well known for his kindness and trouble making. Jumping on stepping stones with Exabarion swimming in the water picking lilies to decorate the village and her underwater den. Training to become a clan seeker. Every griffin of the clan came together in the centre of the misleading forest for the Crescent moon. As Sarayel followed along at the back of the the long single file line walking slowly so Exabarion could have someone with her. As she pulled herself along the treded ground. As they reached the still forming log that the Alpha, Blisc was about to jump up onto. As the log became solid, Alpha jumped easily up onto it and faced the clan. He raised his beak high in the air and sat up straight signalling for silence. When a silence fell over the clan, he scanned the griffins before him to make sure everyone had arrived. He cleared his throat, preparing to speak. Welcome, my clan, to the Initiation Crescent. This is a special ceremony we hold every crescent moon. Exabarion sat next to the warm sizzling fire and sighed. "Where has Sarayel gone off to now? ", she said with a worried look on her face. Sarayel was lying down next to the sparkling waters of the Silver String river. He gently waved his paws in out of the river causing little ripples in the water to form. It was late at night. The only source of light was the moon light and stars overhead. The reflection in water was beautiful. Sarayel pondered in his mind, thinking of a lot of things. The biggest thought he had was what the Clan of Silver String were battling that evening. Was everyone okay? Why couldn't he come and battle too? He had been training since he was very little to go out on battles with the clan but the Alpha would never let him. He says that he was too young and weak. I am not weak thought Sarayel hastily. All of the sudden a twig broke and made Sarayel's heart suddenly start thumping very fast. In the dark Sarayel could see only two green glistening eyes in the distance. Then came out Exabarion, Sarayel's friend. What were you thinking of going out so late? You know that if Alpha found you out here he would be furious and never let you go battle if you don't follow his orders!" Exabarion exclaimed. Sarayel gave a big sigh. "I just needed some peace and quiet. Some time to myself where I can think. That's all," he replied slowly. In the distance Sarayel heard a yelp and then growling. He got the urge that it was a member from the clan and had a sudden impulse. In the next second he was running into the direction of the noises leaving Exabarion by herself Sitting in the same place she had found him by the water. She started after him but once Sarayel started running and then took off into the sky, he was almost impossible to catch. He felt bad abandoning her like that, but he had to go see if the clan was in trouble. In the distance he could see some smoke rising from a clearing near the mountains. Some instincts told him that something bad was happening down there. Sarayel landed behind a large oak tree and peered into the clearing to see what was happening. He saw a dragon. A large dragon. Being attacked by something. The dragon was being attacked by his clan! Two members of the clan were aside in the trees away from the battle. Sarayel wandered closer to them. It was his father. He was lying there very still. He looked injured. His mother was leaning over him crying. Then he went still and a huge depression fell over his mother and himself. His father had left the world. Out of nowhere a arrow struck his mother and she fell to the ground right next to his father. She was gone too. A few archers came out the woods on the opposite end. It all happened so fast. Just a few hours ago he training with his parents and now he is seeing them there dead. He was sad and very angry. He couldn't help himself but to get into that war and battle for what he had just lost. He took the bracelet off his ankle that his parents gave to him for his birthday and it turned into a dagger. Sarayel ran out in the clearing and struck and killed everything that was evil. When it came to the dragon, Sarayel hesitated and remembered what the dragon had done to his parents he lunged at it with all his force. The dragon sliced Sarayel's knee with the tip of the blade on tail and Sarayel started to draw blood. He got angered even more. He could hear voices around him yelling at him to stop and that he wasn't strong enough but that just angered him even more. He kept going even faster. Releasing all his anger and strength on the dragon. Suddenly when Sarayel saw a clear point to victory when the dragon was occupied by the other members of his clan, he lunged from the sky at the dragons neck but the dragon heard him a turned around and caught him in his fist. The dragon's claws were sinking into his tail. Sarayel felt a agonizing paint shoot up threw his spine. In the next instant everything when black. Sarayel woke up with a start. Tears and sweat streaming down his face. The flashback would not leave him alone. It was like the Everlasting field. The flashback felt like it would never end. When he got up, he noticed it was dawn outside. The most beautiful time of the day. With all the colours striking across the sky like a canvas full of water colours blending into each other. As he walked a long the path heading toward the village, his paws getting damp from the dew covered ground, he started thinking about the event that would not leave him alone. He was trying to figure out why it wouldn't leave him. It was a horrible thing to have stuck in your memory. The memory took place 4 years ago when Sarayel was 13 and now he was 17. He tried to concentrate on happy thoughts like the fact that he was going on his first date with Copper this afternoon. Exabarion was a little water griffin that Sarayel had found when he was exploring around the woods near the river when he was 4 years old and they had been friends ever since and now they are finally going on their first date. When he reached the village it was so quite he could hear his own heart beats. Thump. Thump. Thump. He realized that no wonder the village was so quiet, it was only 5:30am. He wandered over to the river and sat down on a rock. He remembered that he had not arranged anything to do with Exabarion so he sat and thought on that rock for few hours and tried to come up with ideas. It was easy coming up with things that he liked, but the hardest part was coming up stuff they both liked doing. When he decided to take a break for a bit he laid down in a nice sunny patch of grass and looked up at the nice clear blue sky. He watched a dragonfly fly around and the thought hit him. Exabarion had never been in the sky before and she was always begging him to teach her how to fy. Well now was her chance. For their first date he would take her flying for the first time in her life and have a picnic on a cloud. He ran across the barren Everlasting field toward the Misleading forest to choose from the wonderful delicacies of pastries and food. He found a beautiful woven basket to use for the for the picnic. It was almost noon, the sun was shining bright in the sky. What a marvellous day to have a picnic in the sky he whispered as he approached Exabarion's den. There was a note on the door saying that she was on a hike going upstream of the Silver String Stream. Sarayel headed off to find her. He travelled for a hour or so searching for her from above. He finally reached the beginning the river but there was no Exabarion in sight. Then he heard a beautiful song coming from behind the shimmering waterfall that crashed with such gracefulness. 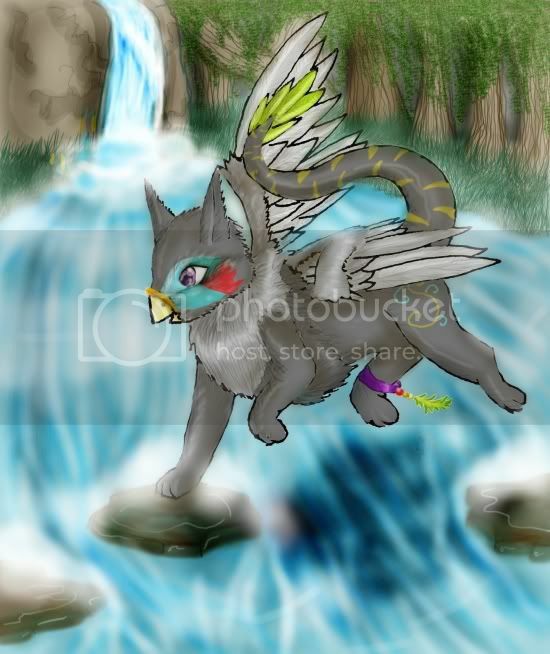 Sarayel landed next to the bank and approached the water fall. He could see a blurry outline of a slim figure. He could tell it was Exabarion from the moment her heard her singing. He called her name but the flowing water drowned out his voice so she could not hear him. He knew that he had to go through the waterfall to get to her. Sarayel was not a huge fan of getting his fur and feathers wet, but Exabarion was worth it. He took in a deep breath and laid the basket on the edge of the water and went through the water. Exabarion was sitting on a patch a grass with a bouquet of flowers in her hands. She was wearing her beautiful colorful feathers behind her ears that was flowing in the soft breeze which was shimmering in the sunlight. Exabarion!" Sarayel said with a relieving look on his face, "I am so happy I found you! Are you ready for our date? Exabarion jumped when she heard because she was not expecting him. Sarayel! You scared me! And of course I am. I was just cleaning up before we went. Where are we going anyways? ", She said with excitement. On a picnic," he told her, "a picnic in the sky! On a cloud of course! I have everything ready! Oh Sarayel! This is going to be amazing! Thank you," she said with absolute joy in her voice. This is wonderful, Sarayel! I have never seen anything more amazing!" She exclaimed. I thought it would be great place for us be have our first date! I knew how much you wanted to someday go up in the clouds, so that is why I thought this would be the perfect spot!" He said. You are so sweet! ", she said softly while giving him a gentle kiss on the cheek. They both blushed. ACK! ", She cried sticking her tongue out and wiping it on her arm. "I have one of your feathers in my mouth!". They both laughed. Sarayel pulled out of the basket a traditional red and white checkered cloth and laid it out across the cloud and and they both sat down on it. Sarayel dug through the basket until he found two croissants and passed one to Exabarion. She gasped when she saw it. Croissants were her favourite pastries. She ate it in a instant whipping the crumbs off with her hand. I am glad you liked it", he said trying not to laugh. She paused and then realized what she had just done. Oops, where are my manners? I should have eaten it more nicely and used a napkin!" She said with embarrassment. "Hey! Don't worry about it! I love a girl with a good apatite! And remember, griffins don't always have the best manners either", he said and they both started to laugh. I love you", she whispered softly inot his ear as she leaned against his soft body. Well, if you didn't than we probably wouldn't be sitting on this cloud eating french pastries and goofing around together!" He said sarcastically. That's when you expose to say I love you too!" She giggled and gave him a playful slap. Okay, okay, I love you too! Duh!" He said going from a blush to a playful smile. The rest of the afternoon, Exabarion and Sarayel relaxed and looked at the view. When it was finally dark they both realized how long they had been up there. So they packed their stuff and set back to the stream. They talked on the way back to the village. They stopped to watch the fireflies fly around and listening the soft melody of the crickets. It was almost twilight when Sarayel finally got to his den. He was exhausted after such a long day! When he curled up on his cozy bed mate, he realized how privileged he was to have such a good life. Yes, he did have some major sadness seek into his life when he was younger but know that was almost 4 years ago! He will never forget that dreadful day but he wont let it stop him from having the time of his life. Sarayel had no trouble falling asleep that night. He had a dream that was about his parents. He hadn't seen them in so long he was starting to forget what they were like which made Sarayel really sad. They were sitting up on top of a tree and a very thick branch looking out to the mountain range. It was the middle of the night and all the stars were shining over head. He heard a faint whisper in his ear but couldn't make out what it said. When he looked back up at were his parents were once sitting, there was only two feathers. He looked around for them. He searched for what seemed hours, he finally gave up hope to find them when he reached the bottom of the mountains. He looked up and hen started to turn around to go home when he heard the whisper again. This time it was louder and clearer. Search, hope and Love will come up ahead... He was confused. Sarayel woke up under his thick moss bedding instead of on top. He sat up and listened to the thunder and rain pouring down on his den. He slowly crept outside without any care of getting wet for once. He felt the hard sprinkle of the raindrops come down onto his feathers and fur. He walked along in the forest on the way to the village to see everyone. He was going to go out training this morning with the Alpha which was a rare and special time. He would pass down all of his knowledge to Sarayel and teach him all of his skills for all different things. Sarayel knew that it would be a long hard day full of new experiences. As he skidded down the slope toward the village he heard a faint sound of a griffin cry. He strained his ears to see if he could hear the cry again but it was silent except for the thunder which was becoming quieter. He assumed the cry was distant and it didn't sound of pain so he let himself forget. Sarayel lay across a fallen log that lay on top of a shimmering lake. He dipped his paw in and swirled it around making little ripples to form. The lake was so still it looked like a sheer slate of ice. He looked at his reflection in the water. A few moments later he realized he wasn't staring at his own reflection but of a another sort of griffins. He sat up in shock staring at the other griffin as it swirled around under the water, bubbles rising from its beak. The griffin started to swim toward him. It came up with a splash and mad Sarayel damped and a bit annoyed. She started at him in a sorry kind of way then it turned into a friendly smile! As I was walking along the trail of the forest, the dirt getting in between my paws and talons, I realized that I didn't belong in this world. The world with all these things with four legs like me, but only walk on two of them. Most of them are lazy. They have all these things that they made bringing them places they want to go and they are destroying there world. I think they know, but just don't care. What I am realizing is that I am not like them. I haven't seen one other creature like me. Big, strong and shy. They are all bare and make there own fur which they call "clothes", but me, I don't have any clothes, I have feathers and fur everywhere. They don't have big long tails, or beaks or wings like me. When they see me, they scream and run. But when they see each other they greet and socialize. But they don't only greet other humans, they greet and socialize with creatures they call cats, dogs, horses and all these other things. What I don't understand is why they don't like me. I always have to transform into one of them so they think I am normal but when I am alone, I am myself. I don't want to be something I am not anymore. I want to be me. I want to meet someone like me. Another griffin. As I soared through the sky, The currents of the wind were rustling against my feathers gently as I soared through the Altadorian sky, feeling on top of the world. I swooped down closer to take a glance at it. It was a beautiful house with a big yard to run around in. In the front there were three there neopets playing about. There was a young girl and a little green eyrie. They were playing with a purple slorg squeaky toy. It looked like lots of fun so I asked if i could join in the game. They said yes, so I came closer and they explained the rules to me. Later on when it was getting close to dark They offered to let me stay which was very kind of them. But I had to say no because I had to go back to my family. I said I would come back soon because I had a blast today. I bet it would be awesome to be in their family! The world was my own. I could soar where I wanted, live where I wanted, sleep where I wanted, and go where I wanted. The currents of the Altadorian sky ruffled within the down of my fur, and my faerie wings were set almost permanently upon the pale sky. Lifting my head to the sun, I let the warm rays of sunlight envelope my senses. My teal fur reflected a perfect turquoise in the sunlight, and the curled fur of my cold coloured mane. Looking down upon the bright forest of Altador, I descended slowly, letting my translucent wings slow down with delicate care. I was king of the skies, they called me – I was proud of that name, it lived on and on. When I safely landed in a small clearing; the scent of faerie's dust and fresh grass spread about throughout me. This clearing was beautiful, and it was only a small part of my home, which laid out as the world to me. I lie down and fell into a sleep, dreaming about one thing – a family. Written by one of my friends, Izzy. As I Sliced the gloomy looking clouds, I blemded deeply into them. I could not see in front of me. It was dark and sad. It was taking over my emotions. Turning them into a sickning depression. I glanced down, and saw a streak of colour through the stormy clouds. I was recheaing my destination. Altador. My home. Sarayel is honoured to be painted Island. He enjoys the beautiful nature and loves to be able to look like it and represent island. He has never regretted choosing island at his initiation ceremony and never will. Other griffins might have chosen a different colour to represent for the rest of their life but not him. He is grateful he got the choice of his colour and had a lot of options to choose from. He is lucky unlike some of his other clan members. Sarayel and Exa have been in a very close bond ever since he rescued her from Scaluwi. Sarayel conquered his fear of water on that mission. Now Sarayel trains all the time with Exa. Despite their differences, they share a lot of the same of the same interested and problems. Even though Exa cannot speak, her actions and movement show her emotions. Sarayel can distinguish each emotion and movement very well which help keep this bond together.